Have you ever watch 2017 movie called Jumanji: Welcome to the Jungle? There is a female character who took part in this movie. She was Karen Gillan who gained critical acclaim after portrayed Ruby Roundhouse. 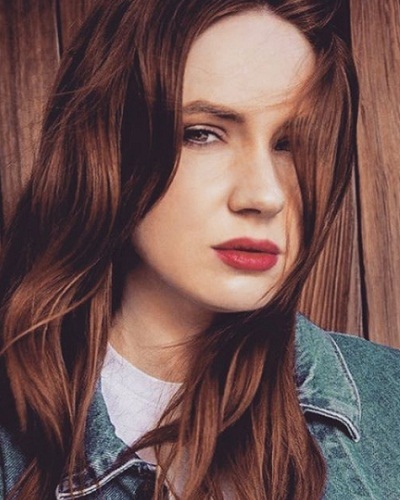 In this article, you will know about Karen Gillan biography, Karen Gillan birthdate, Karen Gillan Instagram account, and her personal life, including her spouse or partner. Moreover, you will know Karen Gillan biography and filmography that will be explained in the next section. For your information, Karen Gillan is not only an actress, but also a director, model, and screenwriter. However, people recognized her from character Amy Pond in Doctor Who series from 2010 to 2013. After that, she took part in more projects in the entertainment industry. She was born in Scotland, 28 November 1987. She moved to Edinburg when she was 16. She attended Telford College in Acting and Performance. After turned 18, she moved to London to study drama class. She enrolled at Italia Conti Academy of Theatre Arts. Her first involvement was Rebus then The Kevin Bishop Show. The next project was The Well which is a horror genre movie broadcasted on BBC Two. Moreover, the other one is Coming Up in 2008. She was part of Doctor Who series and acted as Soothsayer in 2008. Thus, she received the role as Amy Pond in 2010 as a part of Eleventh Doctor Who. Another television series was Selfie as a sitcom on ABC. She played Eliza Dooley, the social media socialite. This series was her first role as the main character, though it's canceled in November 2014. She was also an indie movie titled Not Another Happy Ending with Emun Elliot. The director of this movie stated that she had a vibrant, bubbly, and energetic vibe as an actress. Moreover, he explained that she also had funny and clumsy character as the material for a movie character. Her leading role in the movie was started in Oculus. In 2013, she took a cast to become Nebula in the superhero movie called Guardian of the Galaxy. This movie was released in 2014 and she needed to have a bald head for that role. Furthermore, she appeared in the film "In a Valley of Violence" alongside Taissa Farmiga, Ethan Hawke, and John Travolta. She acted as Ellen who elder sister of Farmiga's character. The next movie was The Big Short alongside Ryan Gosling, Steve Carell, Christian Bale, and Brad Pitt. In 2017, she participated in several movies, such as Guardian of the Galaxy Vol.2 and Jumanji: Welcome to the jungle. The first one was a sequel from 2014 superhero movie and the second one was also sequel from the original film in 1995 Jumanji. She appeared in Avenger: Infinity Stones as Nebula.